So, one day, I got to make it again, and then the elder girl said that although she likes paneer, she liked it a little more spicy (she's really into spice these days owing to her age, I guess :-)), so there was a twist (more fusion too !). PS : My little girl helped me make the pretty bell pepper flowers and ensured I took plated pics of them ;) how cute is that ! 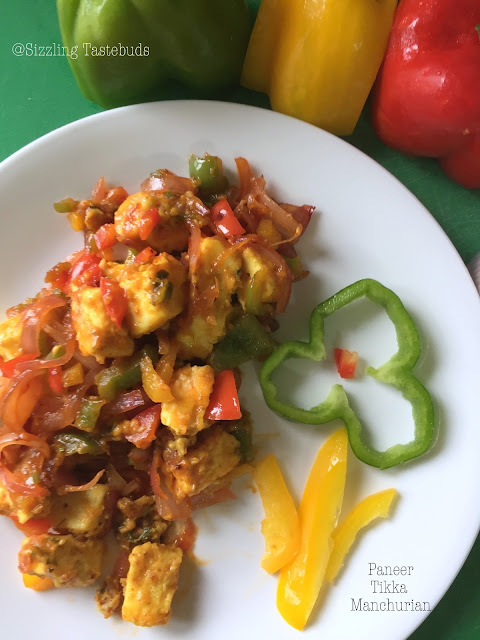 Paneer Tikka - refer the recipe here or use your own recipe. Make the Paneer tikkas as per recipe, make the manchurian dry sauce as above . Toss the paneer a bit in the manchurian sauce and serve immediately. Vegans - can use Tofu or any plant-based cheese, but the taste would vary a bit. That bell pepper flower looks so cute , Children these days are so smart , they catch things really fast . And that dish , it looks awesome ! My family loves Manchurian with any veggie. The bowl looks super amazing and those flowers are so cute. Same pinch Kalyani. Even I have posted a similar version. Love that pepper flower your kiddo has created. The tikka manchurian looks so yum.. Totally agree with you. The bookmarked list is endless. 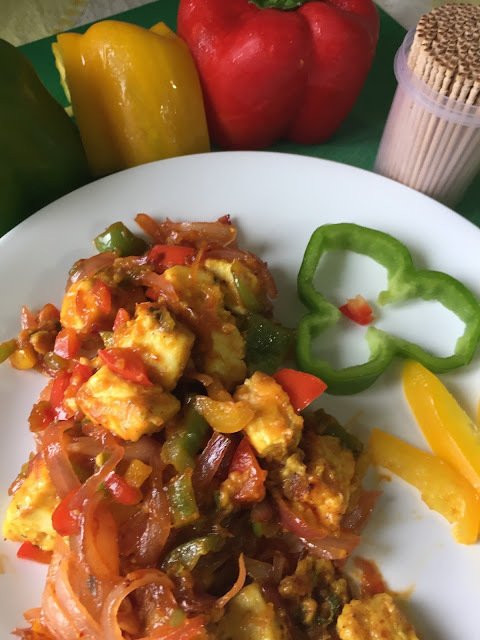 Love anything with paneer....this is a flavoursome dish. Super pick! Hahaha I am yet to make some repeats because I need pictures better than what I have posted but its always later. Same story always. The flower is beautiful can you please tell the LO. As for the manchurian its yum. Love it. Such a flavorful and yummy manchurian.. Capsicum flower looks lovely!! Pretty flower and colorful Manchurian. You're right there are so many posts we need to update or redo. I like your fusion of paneer tikka and Manchurian sauce. Tikka and manchurian together sounds amazing. I can have his all day long. Great share. The bell pepper prop looks awesome Kalyani, do tell your kiddo she must make these more to beautify your pictures..:0)..paneer tikka manchurian sounds so sinful!.. That bellpepper flower looks damn cute and hugs to your lil gal, paneer tikka manchurian looks absolutely irresistible, mouthwatering here. aaw!! That bell-pepper flower is very cute. And paneer dishes are a definite hit at home with kids.